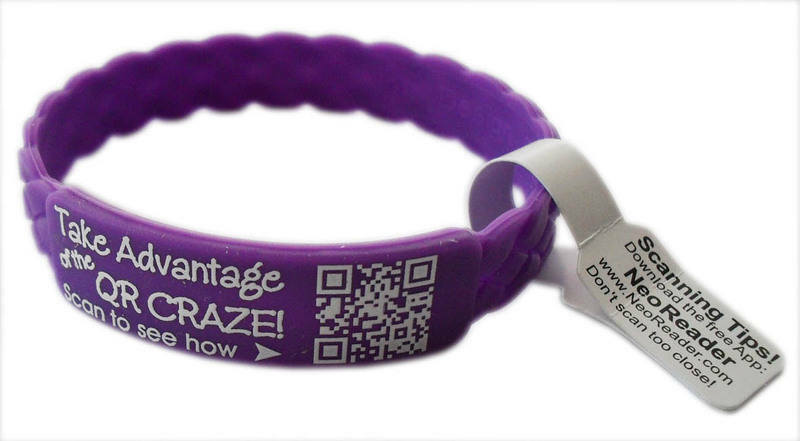 SCANaBAND™ Explained - How Do QR Codes Work With SCANaBAND™ - Custom Printed Silicone Wristbands? SCANaBAND™ is a unique looking silicone wristband, printed with your own, custom-made QR Code, message & logo. QR codes, (Quick Response Codes), have been popular in Japan for many years & are now gaining huge recognition worldwide. The pattern of the QR code has information encoded, that can be read using any smart device such as an iPhone, Blackberry or Android phone with a reader App installed. Curiosity compels people to scan your SCANaBAND™ to see where the code will take them... achieving hits for you like no other product! By using SCANaBAND™ you can take advantage of the growing ‘QR code craze’ to secure your share of the massive, mobile internet market! Drive hits to a URL. Reinforce a social media campaign, by encouraging visits & Likes. Link to any YouTube presentation and inprove your SEO results. Link to your online catalogue or pdf download. Use as a business card, (VCARD), with contact information. Give away at trade shows instead of an expensive brochure & save money. Add a Google Map link to direct people to an event or attraction. Charities can link supporters direct to a donations page. Auto-dial the telephone number of a call centre or support line. Open a self addressed, ready to send email enquiry on the person’s phone. Go an App download page. Incorporate a ‘scan to win’ competition, to further encourage participation. Order your SCANaBAND™ in any silicone colour & our free design service takes care of the details. OUR RANGE INCLUDES: RUBBER BRACELETS UK, PRINTED RUBBER BRACELETS, WRISTBANDS, CHEAP WRISTBANDS, BEST WRISTBANDS UK, CHEAPEST WRISTBANDS, WRISTBANDS FREE DELIVERY, PRINTED BRACELETS, CUSTOM PRINTED BRACELETS, CHEAP BRACELETS, CHEAP PRINTED BRACELETS, BUY PRINTED BRACELETS UK, CUSTOM PRINTED BRACELETS UK, CHARITY BRACELETS, FUNDRAISING BRACELETS, SCHOOL BRACELETS, COLLEGE BRACELETS, UNIVERSITY BRACELETS, CLUB BRACELETS, FESTIVAL BRACELETS, EVENT BRACELETS, PRINTED BRACELETS, CHEAPEST PRINTED BRACELETS, BEST SILCONE BRACELETS and MORE!